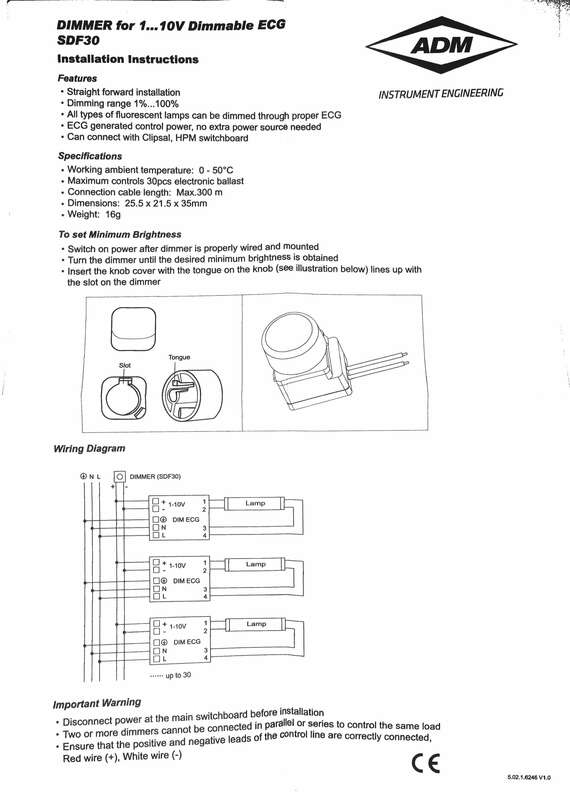 Analogue 1-10V Dimming Switch - VOLKA Lighting Pty Ltd. Fits into most standard wall plates. The SDF-30 is an electronic 1-10V dimmer pot, which is compatible with the Mean Well HLG ‘B’ and LPF-D LED drivers. Being a two-wire pot, all that is required is to connect them to the two dimming wires from the Mean Well LED driver. No external power supply is required. By wiring the dimming leads in parallel the SDF-30 can be used to control multiple Mean Well LED drivers at the same. The SDF-30 compatible with Clipsal and HPM (and probably other) switch plates, so they can be mounted in a standard architrave switch fitting. They do not dim all the way to zero, so a separate on/off switch will be required. Click the button below to add the Analogue 1-10V Dimming Switch to your wish list.